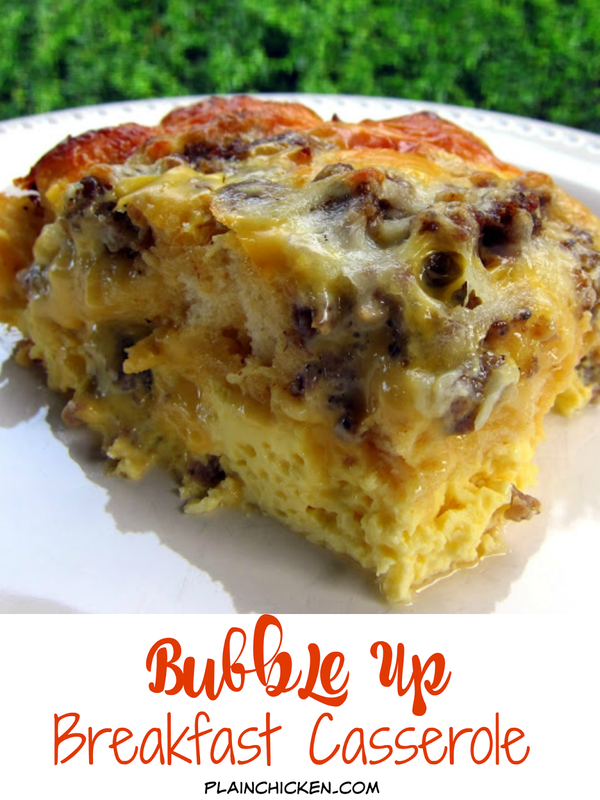 Bubble Up Breakfast Casserole - sausage, eggs, cheese and biscuits. SO good! Great for baby showers, overnight guest and the holidays. Only takes minutes to make. Quick and easy breakfast recipe! I've made several bubble up casseroles - pizza, white pizza and even an enchilada bubble up casserole. They are all fantastic. I was looking for a new breakfast casserole for Father's Day and decided to try a bubble up breakfast casserole. I cooked the sausage and whisked up the eggs the night before. I stored everything in the fridge overnight. I assembled the casserole first thing in the morning and baked it. It turned out great. It was definitely a crowd pleaser; Everyone raved about it. I especially loved the all the melty cheese! Give this a try for breakfast or even dinner. Quarter biscuits and place in pan. Top with cooked sausage, Velveeta and mozzarella. Whisk together eggs, milk, garlic powder, salt and pepper. Pour over cheese and biscuits. Bake 30-45 minutes, until golden brown. Allow to cool for 5-10 minutes before serving. What a great idea! I love the simplicity of this recipe and what I love even more is that the whole family gets to eat warm eggs at the same time. Sounds like this is breakfast one day next week while on vacation. I'm not a big sausage fan so I think bacon is called for in it's place. I can see why this was a hit! What a great weekend breakfast! I made three of these for a family reunion breakfast. Also made 10 pounds of crockpot roasted potatoes. 30 or so people demolished all of it, with a few going back for seconds. Not one bite of the casseroles left. Thanks so much! Made this for work today and it was a big hit! Served it with some syrup for us savory sweet folks. All of your recipes are flawless! Thanks! Made this today for breakfast It was awesome! Can't wait to try the bubble up buffalo chicken next! So glad you enjoyed the breakfast bubble up! The buffalo chicken bubble is awesome too! Enjoy! Would this work with Crescent Rolls instead of the biscuits? I'm not sure. You could definitely give it a try. Would this work with bread? You could give it a try and let us know how it turns out. How much salt do you recommend? I would add about 1/8 teaspoon of salt. Has anyone made this with shredded cheddar instead of velveeta? Thats all I have on hand.